Whether you’re a local or a tourist to Atlantic Beach, North Carolina, chances are you’ve heard of AAA Member Captain Maurice Davis. Davis is the skipper of the Capt. Stacy IV, the head boat for the Capt. Stacy Fishing Center, a popular fishing charter company located on the Atlantic Beach Causeway. This family business was launched over 50 years ago by Davis’s parents Sonny and Joyce, and named for Sonny’s father, Stacy, who was also a sea captain. When Maurice and his brother were old enough, they worked as deckhands. Davis earned his captain’s license at 18, and has been on the water ever since. Davis stays busy running fishing charters from March through April and from September until Thanksgiving. When Capt. Davis isn’t on the water, you’ll find him in his maritime art studio and gallery, located across the street from Capt. Stacy Fishing Center. 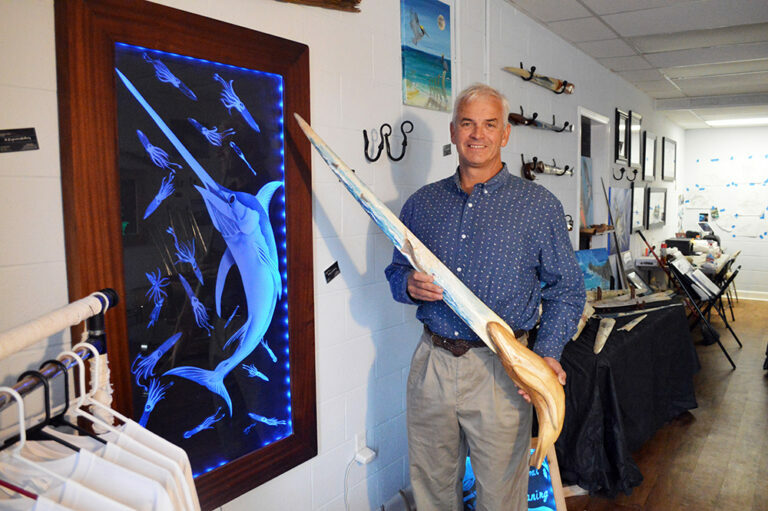 Davis began his art career creating scrimshaw pieces from locally caught swordfish bills. Scrimshaw art dates back to the 1800s when whalers would carve scenes onto bones or teeth from sea animals like whales or walruses. They often depicted nautical scenes and motifs like anchors and ships. Davis also creates glass etchings, oil paintings and wood carvings, which are available for sale in the gallery. From earning discounts on attractions and hotel stays while vacationing to getting a helping hand after a breakdown, Davis makes the most of his AAA Membership.